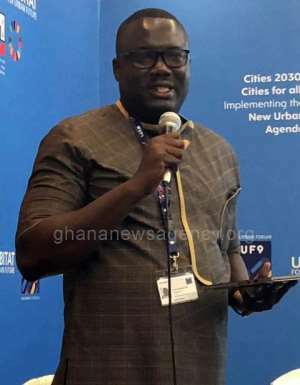 Kuala Lumpur, Feb. 12, GNA - Felix Nii Anang-La, Metropolitan Chief Executive for Tema has said the growth of urban population has a strong correlation with increase in demand for land for physical development. According to him, a survey conducted in 120 cities across the world (Beall, 2006), population growth rate of 17 per cent of 120 cities between the years of 1990 and 2000 led to 28 per cent increase in built-up areas. He said spatial planning was the task of integrating the economic, social and environmental dimensions of territorial strategies with the ultimate aim of ensuring that development outcomes were sustainable. He said an unplanned and unmanaged urbanisation could lead to increased inequality, the growth of slums and other disastrous impacts. Nii Anang-La said urbanisation represented a response to socio-economic, political, demographic or environmental conditions, characterised by an unprecedented concentration of humans into cities. He said planning in Ghana was then centralised and that the scope of planning had now broadened after independence to include; spatial aspects as the 30 years gap in planning in Ghana came as a result of political instability. He said Localising the New Urban Agenda was to promote spatial planning as a pre-requisite for Ghana's current Industrialisation drive. Mr Nii Anang-La said the growth of cities and rapid rate of urbanisation in Africa was the least in the region which would soon be called 'world city' and said Africa's urbanisation was 15 per cent in 1960, 40 per cent in 2010 and projected to reach 60 per cent in 2050 as urban population was expected to triple in the next 50 years. The Tema Chief Executive said, Ghana's urban population was at 55.3 per cent and that his area Urban Growth was in line with the world trend as urbanisation rate in Ghana was 3.4 per cent per annum. He compared with population growth of 2.6 per cent per annum and its implication for housing, job creation and land for other uses. UN-Habitat 2016 report indicated that as at 2014, an estimated number of 54 per cent of the world's population lived in urban areas.